Radiant Saunas are the safe, effective and affordable way to relieve stress and improve health, right in the comfort of your own home. This 3 Person Cedar Corner Infrared Sauna fits conveniently into the corner of the room and the natural Canadian Red Cedar wood will enhance any decor. Exclusive InfraWave FAR heater technology emit ultra low levels of EMF, making them safe and beneficial to your health. It's EZ Touch dual interior and exterior LED control panels allow for easy temperature control. This unit is available with Carbon heaters and is loaded with tons of extras, including: towel hooks & magazine rack, CD Player with mp3 plug-in, back rests, 7 colour chromo therapy light and an oxygen ionizer. Constructed from top grade Red Cedar with tongue & groove joinery to create a superior strength edge to edge, these saunas are built to last, providing you with years of health benefits and stress relief. Now you can have the benefits of a Therapeutic Health sauna in your home. Better Life Sauna uses a safe radiant infrared heat source to ease joint pain & stiffness, reduce stress & fatigue and burns up to 600 calories in a 30 minute session. Most spa orders ship in 21 business days. Allow an additional 10 business days for standard ground delivery. Sit back, relax, and enjoy the numerous health benefits of a Far infrared sauna in the comfort of your own home with Canadian Spa Companys 1-person Infrared Sauna. This sauna is equipped with a simple yet advanced digital control system, Bluetooth Audio System, LED Chromotherapy Lighting, and an aromatherapy system. Six Far Infrared Carbon Heaters work to ensure that heat is distributed quickly, evenly, and efficiently to help achieve the maximum benefits of a full body sauna treatment while keeping energy costs low. A natural Canadian hemlock wood construction adds a calm, earthy feel that will complement any decor, while dual-wall construction ensures that your sauna is well insulated. All Canadian Spa Company Saunas are designed to exceed all required safety standards, and maintain competitively low levels of EMF. Take advantage of the numerous health benefits that the latest infrared sauna technology has to offer right in the comfort of your own home. Regular usage of Canadian Spa Companys 2-person FIR Sauna will help remove toxins from your body, aid in weight-loss, help relieve body aches and muscle pain and much more! This sauna is equipped with a simple yet advanced digital control system, Bluetooth Audio System, LED Chromotherapy Lighting, and an aromatherapy system. Eight Far Infrared Carbon Heaters work to ensure that heat is distributed quickly and evenly to help achieve the maximum benefits of a full body sauna treatment while keeping energy costs low. A natural Canadian hemlock wood construction adds a calm, earthy feel that will compliment any decor, while dual-wall construction ensures that your sauna is well insulated. All Canadian Spa Company Saunas are designed to exceed the safety standards required for an infrared sauna, and maintain competitively low levels of EMF. Take advantage of the numerous health benefits that the latest infrared sauna technology has to offer right in the comfort of your own home. Regular usage of our 4-person FIR Sauna will help remove toxins from your body, improve the look and feel of your skin, aid in weight-loss, help relieve body aches and muscle pain, and much more! This sauna is equipped with a simple yet advanced digital control system, Bluetooth Audio System, LED Chromotherapy Lighting, and an aromatherapy system. 12 Far Infrared Carbon Heaters work to ensure that heat is distributed quickly and evenly to help achieve the maximum benefits of a full body sauna treatment while keeping energy costs low. Two benches provide enough space for you and your friends to sit comfortably in one space. A natural Canadian hemlock wood construction adds a calm, earthy feel that will complement any dicor, while dual-wall construction ensures that your sauna is well insulated. 3-Person Cedar Corner Infrared Sauna with 7 Carbon Heaters Radiant Saunas are the safe, effective and affordable way to relieve stress and improve health, right in the comfort of your own home. This 3 Person Cedar Corner Infrared Sauna fits conveniently into the corner of the room and the natural Canadian Red Cedar wood will enhance any decor. Exclusive InfraWave FAR heater technology emit ultra low levels of EMF, making them safe and beneficial to your health. It's EZ Touch dual interior and exterior LED control panels allow for easy temperature control. This unit is available with Carbon heaters and is loaded with tons of extras, including: towel hooks & magazine rack, CD Player with mp3 plug-in, back rests, 7 colour chromo therapy light and an oxygen ionizer. Constructed from top grade Red Cedar with tongue & groove joinery to create a superior strength edge to edge, these saunas are built to last, providing you with years of health benefits and stress relief. 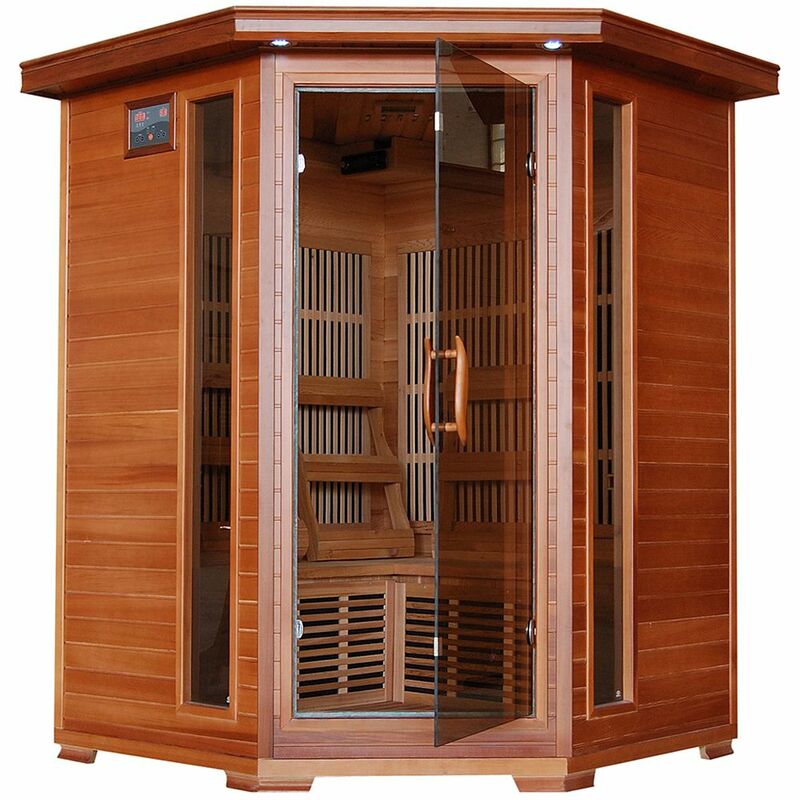 3-Person Cedar Corner Infrared Sauna with 7 Carbon Heaters is rated 4.0 out of 5 by 3. Rated 5 out of 5 by HomeDepotCustomer from We love it even our granddaughter who has played ... We love it even our granddaughter who has played college softball says it is the nicest one she has used. Rated 2 out of 5 by Wisp69 from I feel as though for the cost of this unit, the over quality of the product could be much better.... I feel as though for the cost of this unit, the over quality of the product could be much better. It takes a long time to get to temp and the only way I am getting three people in it is if they cram together.